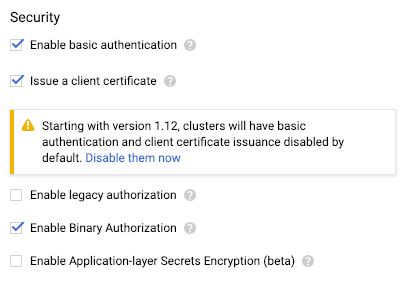 This Quickstart shows how to configure and test a simple policy in Binary Authorization. 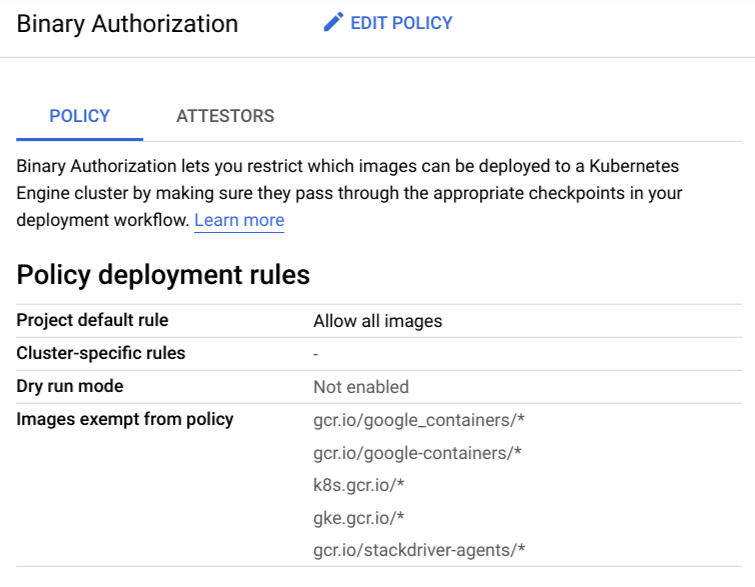 In this Quickstart, you view and test the default policy, and then configure the policy to deny the deployment of all container images from Container Registry to a Google Kubernetes Engine (GKE) cluster. This is not a real-world policy. In a real-world policy, you typically require attestations by attestors in your environment before a container image can be deployed. See Getting Started Using the CLI or Getting Started Using the Console for a longer tutorial that describes how to configure a policy with required attestations. The first step is to set the default Google Cloud Platform project used by the gcloud command. It can take a few minutes for this operation to complete. By default, your Binary Authorization policy is configured to allow all container images to be deployed. You can test the policy by trying to deploy a sample container image to the cluster. For this Quickstart, you use the sample container image located at the path gcr.io/google-samples/hello-app in Container Registry. This is a public container image created by Google that contains a Hello, World! sample application. Now, verify that the deployment was allowed by Binary Authorization. Go to the GKE Workloads page in Google Cloud Platform Console. A workload for the deployment appears with a green icon that indicates that the image was deployed successfully. Click the name of the workload where it appears in Google Cloud Platform Console. Click Delete from the menu items at the top of the page that appears. Now, modify the policy to block instead of allow all images to be deployed. In a text editor, change the evaluationMode from ALWAYS_ALLOW to ALWAYS_DENY. Again, test the policy by deploying a sample container image to the cluster. This time, Binary Authorization blocks the image from being deployed. Return to the GKE Workloads page in Google Cloud Platform Console. A workload for the container image appears with a red icon that indicates that the image failed to be deployed. Return to the GKE page in Google Cloud Platform Console. Select Clusters in the left-hand navigation panel. Select the checkbox next to the name of your cluster and click Delete.